The 2013-14 Philadelphia 76ers came out on fire to begin the season, starting with a surprising opening night win over Lebron James and the 2 time defending NBA Champion Miami Heat. Despite losing prized rookie Nerlens Noel probably for the entire season, Michael Carter-Williams, the #11 overall pick in last year’s draft has arguably been the best rookie on the planet, regularly flirting with a triple-double, while leading the Association in steals. New coach Brett Brown has instilled a defensive identity and has invigorated former #2 pick Evan Turner, finally freed from the Doug Collins doghouse, into a potential All Star and legit 20 ppg scorer. So what happened to all of the talk of “tanking?” In a bad Atlantic Division, Philly has flirted with first place, by virtue even potentially earning a Top 4 seed in the East as a result. That was until a recent losing skid which has seen Philly drop 8-10 games, partly due to not having the services of Carter-Williams due to injury. The Sixers are now falling back to where we originally thought they would be, having one of the worst records in the league. Losing is not completely a bad thing as that was the plan all along, stockpile draft picks in the loaded 2014 Draft, and make a speedy return to respectability and even compete for an NBA crown in a few seasons. 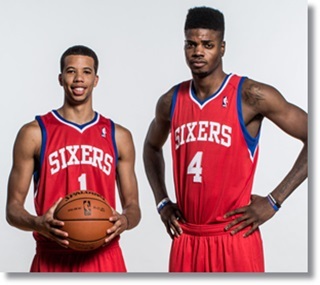 I’m not sure most understand just how good of a situation the 76ers could be in. They already have their own projected Top 5 pick(they have the 6th worst record right now) plus the New Orleans Pelicans pick, which also should be in the 9-12 range, unless Anthony Davis remains out for an extended period of time. Eric Gordon and Tyreke Evans have also had trouble staying healthy so a top 10 pick wouldn’t be out of the question. 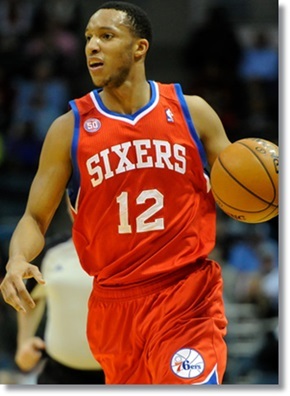 Now, it’s no secret that veteran 76ers Thaddeus Young, Spencer Hawes, and Evan Turner are all rumored to be on the trading block. Spencer Hawes, in the midst of a career year(15.1 ppg, 9.7 reb, 1.6 blk, .427 3PT%), is in the final year of his deal. Thad Young(15.8 ppg, 7.1 reb, 1.3 stl) and Evan Turner(20.7 ppg, 6.6 reb, 3.9 ast) could be key players come the trade deadline. Young is still owed more than $9 million next season plus a player option for ’14-’15 while Turner becomes a restricted free agent following this year. Young is probably the most in demand, especially to a contending team like Houston, in search of an athletic PF to pair with Dwight Howard. Hawes could either be dealt to a team in need of a multi-talented big that is one of the better 3 point shooters in the league(check the numbers), but it is still unclear what Turner’s future is in Philly as it seems that the former NCAA POY has finally figured the NBA game out. A trade of any of the three by the team would undoubtedly require a 1st round pick in return bringing Philadelphia a total of 3 1st Rounders in next year’s loaded draft. The Sixers also have 3 2nd Rounders next June that could be packaged to produce another 1st Round pick, giving Philly a minimum of at least 4 1st Round picks in a draft that includes prized freshmen players like Andrew Wiggins, Julius Randle, and Jabari Parker plus a bevy of talented upperclassmen like Marcus Smart, Doug McDermott, Russ Smith, and Shabazz Napier. Add in the fact that with giving a qualifying offer to Turner for next season, the Sixers have only a tad more than $23 million on the books, giving them some of the most money of any team to spend in free agency. Think of a starting line-up of MCW, Marcus Smart, Evan Turner, Aaron Gordon, and Nerlens Noel, plus help off the bench from Doug McDermott, Adrien Payne, Tony Wroten, and Arnett Moultrie, plus another mid to high level free agent. It may look dire right now, but the picture is becoming clear that the future is bright in Philly, as they could be one of the most exciting teams on the rise for next season.